Come and enjoy our home away from home and experience true mountain beauty. Nestled on the corner of the building overlooking a babbling creek and nature trail from one balcony. Also view the courtyard, pool and ski slope from the other balcony. Wonderful privacy but yet so close to everything! Surrounded by Aspen trees. 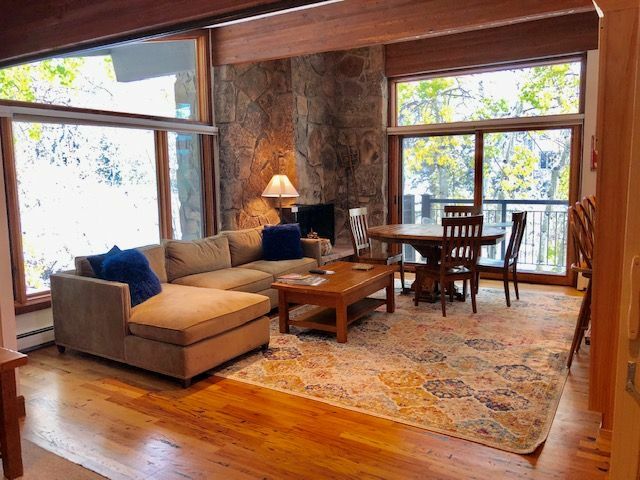 You'll have the cozy feeling of a get-away in the Rocky Mountains. Hardwood floors and granite counter create an elegant atmosphere. It has a soothing gas fireplace in the living area. The modern kitchen has been well stock with anything you need! The extra windows bring in wonderful light, while the trees outside offer privacy. The master bedroom has a king bed, the second bedroom has a queen with an over-sized chair twin sleeper. The den has two day beds, with an accordion wood wall. When closed it has its own private full bathroom. Each bedroom has a queen bed and full bathroom. The sleeper den has a wooden accordion wall for privacy and a full bathroom as well. For extra sleeping flexibility in addition to the sleeper den, the second bedroom has a love seat that opens up into a regular twin bed. The condo has its own washer and dryer. Our covered private parking is underneath the condo for easy access. Or if you don't have a car, the free village shuttle is just steps away, along with the free bus that will take you into Aspen in less than 20 minutes. Jump on the elevator or take the stair case to get on the slopes. Our on-site management staff to help you settle in for a carefree experience. We have a huge return guest ratio so book early for a dream vacation in the Rocky Mountains! Come experience a wonderful vacation at Shadowbrook Condos in Snowmass Village. Highly recommend this rental. Everything was great. As always, it was a great experience in Snowmass and in Shadowbrook. I hope to be back soon. This condo was great. It is close to everything in Snowmass. The condo itself was clean and well equipped. The pool and hot tub was great and really close to the condo. Thank you so much for your kind review. Our property is centrally located and offers beautiful views. We hope that you will think of us when returning to Snowmass Village! Everything was perfect; hospitality, location and support from the management team; mother nature also helped with tons (feets) of snow. This condo is very nice. Plenty of room for everyone. 2 decks. Great views. Nice hot tub/pool area. Beautiful landscaping. Great customer service. Convenient parking. Summer events are numerous in the Snowmass area. Aspen Music Festival, Wine and Food Festival, Arts and Craft Shows, Free Concerts every Thursday night on Fanny Hill, Jazz Aspen/Snowmass and much much more!